George Berkeley (1685-1753) was a university teacher, a missionary, and later a Church of Ireland bishop. The over-riding objective of his long philosophical career was to counteract objections to religious belief that resulted from new philosophies associated with the Scientific Revolution. Accordingly, he argued against scepticism and atheism in the Principles and the Three Dialogues; he rejected theories of force in the Essay on Motion; he offered a new theory of meaning for religious language in Alciphron; and he modified his earlier immaterialism in Siris by speculating about the body's influence on the soul. His radical empiricism and scientific instrumentalism, which rejected the claims of the sciences to provide a realistic interpretation of phenomena, are still influential today. 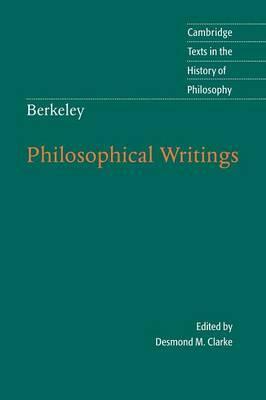 This edition provides texts from the full range of Berkeley's contributions to philosophy, together with an introduction by Desmond M. Clarke that sets them in their historical and philosophical contexts. Introduction; Chronology; Further reading; Note on the texts; A New Theory of Vision; A Treatise concerning the Principles of Human Knowledge (Part I); Three Dialogues between Hylas and Philonous; An Essay on Motion; Alciphron, or The Minute Philosopher [excerpts]; Siris: A Chain of Philosophical Reflexions and Inquiries Concerning the Virtues of Tar-Water [excerpts]; Glossary; Index. Desmond M. Clarke is Emeritus Professor of Philosophy at University College Cork.